You’ve recently lost your job. Especially if the termination was a surprise, you may have a lot of questions about your situation. But right now, there’s no more important question than this: were you fired – or were you laid off? Being fired and laid off are two distinct ways of losing your position, and the difference can impact your eligibility for unemployment, as well as your hiring prospects for the future. Therefore, it's a good idea to be very clear about the precise nature of your termination, should you lose your job. If that sounds like it should be an easy distinction to make, you're right: ideally, your former employer would be very clear about the nature of your separation from the company. But as we know, the real world is often far from perfect. Here's what you need to know about the differences between being fired and being laid off, and how to know where you stand when you lose your job. An employee can be fired for a variety of reasons. Perhaps the most common reason for being terminated for cause is an unsatisfactory performance on the job. Workers might also be fired for misconduct, not complying with company standards, taking too much time off, damaging company property, embarrassing the organization publicly, or otherwise failing to adhere to the terms of his employment contract. When an employee is fired, there is no expectation of being rehired at a future date. This type of termination is not temporary and is related to the employee’s performance or behavior, not to the company’s financial situation. When an employee is laid off, it typically has nothing to do with the employee's personal performance. Layoffs occur when a company undergoes restructuring or downsizing or goes out of business. In some cases, a layoff may be temporary, and the employee is rehired when the economy improves. In some cases, laid-off employees may be entitled to severance pay or other employee benefits provided by their employer. Generally, when employees are laid off, they’re entitled to unemployment benefits. The first thing you need to figure out, as a newly terminated employee, is how your former employer will characterize your separation from the company. If you are an at-will employee – and workers in most states in the U.S. are – your employer is under no obligation to furnish you with a reason for your termination. But it's still appropriate for you to ask them how they'll refer to your termination when speaking to future employers and the state unemployment office. 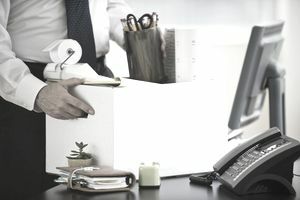 Typically, employers will ask laid-off employees to sign an employment separation agreement, sometimes (but not always) in return for a severance package. It's always a good idea to take time to read and consider the agreement before signing. Don't sign anything in the heat of the moment, directly after learning of your termination. In addition, it's often wise to consult an employment attorney. To collect unemployment, you typically need to have lost your job "through no fault of your own." People who are laid off are likely to receive unemployment because they left due to restructuring rather than personal performance. People who are fired are less likely to receive unemployment because they left due to issues with their personal performance. However, if a fired employee can argue that their firing was unfounded or unrelated to performance, he may be eligible for unemployment. If you are unsure whether or not you qualify for unemployment, check with your state unemployment office. If you lose your job unexpectedly, it’s important to know where you stand. You may be legally entitled to pay for unused time off, for example. Your former employer should also tell you what to expect in terms of receiving your last paycheck, rolling over retirement benefits, and accessing COBRA coverage. It’s also important to know whether your separation from the company counts as wrongful termination. If you were fired for certain discriminatory reasons, asked to commit an illegal act, or because you’re a whistleblower, you may be protected under state, federal or contract law. Consult an employment attorney for more information about your specific situation.